What can I claim for "Use of Home as Office"? If you're self-employed and working from home, you're entitled to claim for part of the running costs of your home against your tax bill. The simplest way to do this is by using HMRC's "Flat Rate Method". If you're a sole trader or a partner and you're not VAT registered, you're eligible to use this method. All you need to do is work out how many hours you work from home each month and claim accordingly. This is certainly the quickest method but not necessarily the best. If you're prepared to put in a little extra legwork and dig out some invoices, then working out the actual running costs may be more beneficial. Count the number of rooms in your house excluding kitchens, bathrooms, halls and landings (alternatively you can measure the floor space but that is time consuming and not necessarily any more advantageous unless the room you use as your office is very large). For example, if you have 5 rooms, then you can claim 1/5 or 20%. Next, work out the estimated percentage of time the room is used for business. Don't get too bogged down with this, HMRC are just looking for a fair and reasonable reflection of your circumstances. They're not going to come round and time you. Let's say 75% for our example. One important thing to note here is that if you use a room in your home 100% for business purposes, you will have Capital Gains Tax issues if you ever sell your house. 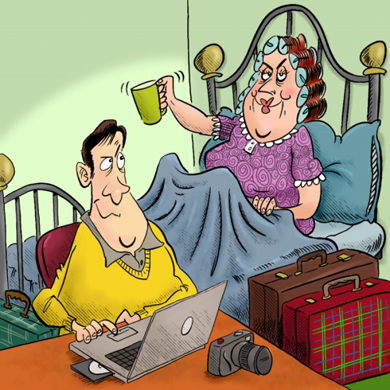 Always have another use for your room, for example a guest room, and maybe invite the mother-in-law to visit more often! Other costs such as telephone, broadband, repairs and maintenance to the actual room used, and cleaning are apportioned by the percentage of business use only and not by the number of rooms. This percentage may vary by each expense. If you're a director of your own Limited Company, technically you're an employee and different rules apply. Have a separate office in the garden? If it's included in the bills for your home, count it as an extra room. If it isn't included, count it as a one room home. Same rules apply re 100% use. NOTE: The information contained in this article is of a general nature and is intended only to provide an overview. It is not a substitute for professional advice.